Recently the Rewards Canada family enjoyed another vacation in Southern California! During this Spring Break trip we had two hotel stays, one was at the Loews Santa Monica (which I'm not doing a review of) and the other was in Newport Beach where we stayed at the Newport Beach Marriott Hotel and Spa. The hotel is really nice and while on the outside it may seem old, the interiors appear to have been renovated recently. The hotel lobby, grounds, pools and the rooms in general were up to date and clean. For our stay we had a two double direct ocean view room connected to a single king room. The size of the two rooms combined was great for our family of four. The king room is bigger than the two double room which is surprising, you'd think it would be the other way around! Maybe this little tidbit of info can help you out if you are planning on booking this hotel! The rooms we received were on the 7th floor of the main tower that house the hotel lobby, restaurant, Starbucks and more. The double room had a tub in the bathroom and the king had a walk in shower. The pictures I have for this review are of the king room with the walk-in shower. The direct ocean view was facing towards the Pacific Ocean of course, although that is a few miles away. You do have a view right on the golf course and the main pool area. Speaking of pools, the resort has three pools in total. Two that are open to all and a third for the spa. The thing is though everybody has to pay the resort fee for staying here and that resort fee includes access to the spa pool. The resort fee also covered internet, access to the spa steam room and two bike rentals for two hours per day. What was great about our stay as well was that we were there during the midweek and the only people that seemed to be at the hotel were conference goers which meant the pools were dead and it was like we had the resort to ourselves. Seeing that both my wife and I are Marriott Elites we had access to the club lounge. We only visited the lounge once during our three night stay because they provided free water in the hotel room anyways and it was quite a jaunt to go there for snacks and drinks as the lounge is in a separate building because there are two towers that make up the hotel. The only negative part about our stay at this hotel was the service at the Hook and Spear Restaurant and Lounge. Since the resort was quiet there was no pool service for food and drinks which meant I had go to the restaurant for drinks. On one occasion all the doors were open and no one was in the restaurant. I walked into the lounge and there was a lady setting up the lounge as it was about to open. She told me I have to go to the restaurant to order drinks. I went back there and had to wait until somebody actually showed up. The waitress took my order and ended up going to the lady who was setting up the lounge to make the drinks. Suffice to say about 15 - 20 minutes of my time was wasted just waiting to get the drinks ordered. We did eat at the restaurant once for lunch and once for breakfast and overall the food was pretty decent but I must say the service was spotty. 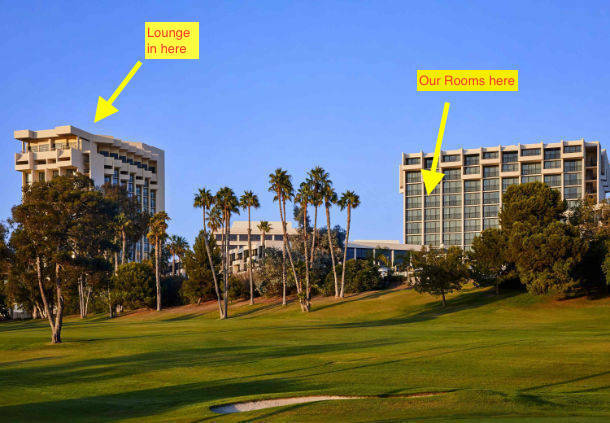 The location of the hotel is ideal for those wanting to explore the Southern California beach towns of Newport Beach, Huntington Beach and Laguna Beach. All are within about a 1/2 hour to 3/4 hour drive. It is also located right next to Newport Beach's Fashion Island shopping center. Of course being with three girls, the mall was thoroughly enjoyed and also offers some great dining options including Rick Bayless' Red O Restaurant which we did dine at one night and would recommend to anyone wanting his take on Mexican cuisine. 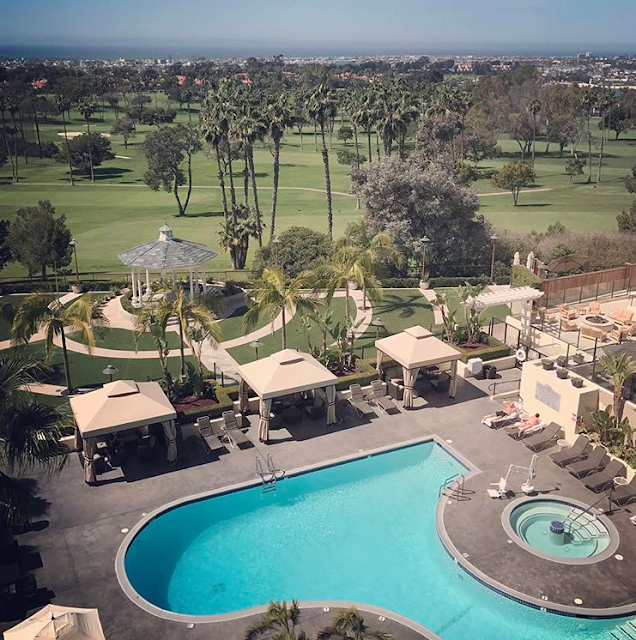 This hotel turned out to be better than we had expected and would recommend it for families, solo travelers and generally any one else who needs or wants to stay in the Newport Beach area especially if you are loyal to Marriott Rewards or Starwood Preferred Guest. There are several buildings with what appear to be various room/bed options so I can't speak to the other accommodations on site but the direct ocean views in the main building are definitely a good choice if you want to stay here. With three pools, the golf course, shopping, bike rentals etc. the hotel offers up the best of both worlds, that is the amenities of a city center hotel and a beach resort all in one. You really can't ask for much more. Talk to us! Have you stayed at the Newport Beach Marriott Hotel and Spa? What are your thoughts of the hotel? Or are you planning to and looking forward to it? Let us know below!